Reference number for this case: 16-oct-54-Lesparre. Thank you for including this reference number in any correspondence with me regarding this case. A man signing H. G. and claiming to be a professor of history and geography sent to the Sud-Ouest newspaper an anonymous letter; which the newspaper prudently published on October 20, 1954, while pointing out its lack of credibility. The man told that in the area of Lesparre, in October 16, 1954 in the night, he drove slowly towards Lesparre, and saw an orange gleam in the bushes. He said he pulled off, approached, and saw a round machine approximately 5 meters in diameter, and a sort of diver, about one meter tall, which approached him and repeated several times "KA-A-BO-O-TRI-TO-OUN", then moved away, entered the machine through some sort of porthole, and the machine rose quickly and vertically. New case but dubious for lack of an investigation. 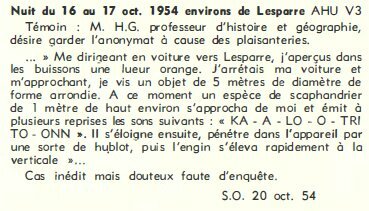 The authors indicate that a professor of history and geography, on October 16, 1954 in Lesparre-Médoc, saw a strange orange gleam in some bushes. He approached driven by curiosity and saw a round machine of a diameter of 5 meters, with a sort of diver of a height of one meter in the vicinity. The diver approached the witness, emitting on several occasions the following sounds: "ka-a-lo-o-tri-to-onn." He then entered then the machine though a sort of port-hole, and the machine rose fast vertically. The authors indicate that to their knowledge there was no serious investigation of that case. "Lesparre-Médoc - 33: untraceable witness after investigation. Anonymous letter to a big national daily newspaper of the South-West." Further in their book they make the consideration than the case "cannot be considered" because there is a "talkative occupant." "In the night of Saturday to Sunday, I was going at a small pace towards Lesparre, I saw an orange gleam in the bushes. I stopped my car and approached. I saw a machine of approximately 5 meters in diameter, of round shape. At this time, a sort of being high of approximately 1 meter approached me and repeated several times "KA-A-BO-O-TRI-TO-OUN." It then moved away, entered in the apparatus by a sort of port-hole and the machine rose quickly vertically." "M. H.G. neither tells his name, nor the place of his residence and locates his observation in the area of Lesparre (the Gironde), but he explains himself however, with an astonishing memory." They note that in the copy of the article of this newspaper in the file of Lumières Dans la Nuit, all the article is accurately reproduced, except for the size of the machine which changed from 5 meters in diameter to 50 meters in diameter. Elsewhere in their book they say that the case must be eliminated because the UFO occupant talked. Jean Sider indicates that the case of Lesparre-Medoc in the Gironde was in fact an anonymous letter, probably just a good joke, published in the Sud-Ouest newspaper of October 20, 1954, while "debunkers" Barthel and Brucker have claimed to have contacted the witness. Sider indicates that Barthel and Brucker thought they would "get away with it" by insisting that the LDLN case speaks of 50 meters, and that they probably indicate on page 208 that the witness was untraceable after investigation without specifying same on page 48 to increase their count of "solved cases." He points out with reason that it is absurd to speak about "untraceable witness after investigation" whereas the witness was anonymous. The Belgian ufologist indicates that on October 16, 1954 in France in Lesparre-Medoc, a professor of history and geography ensured to have seen in the bushes an orange gleam that puzzled him. While approaching he saw a round object, 5 meters in diameter, with nearby a sort of one meter high diver who approached the witness while emitting on several occasions the following sounds: "ka-a-lo-o-tri-to-onn". It then penetrated in the apparatus by a kind of port-hole, then the machine rose quickly vertically. The source is indicated as J.L. Ruchon, "Ovni, premier dossier complet...", Alain Lefeuvre publisher, 1979, page 176. A history and geography teacher, driving along the road at night, saw in the bushes along his route an orange light. He stopped the vehicle and approached on foot, discovering an object, about 5 meters in diameter and round in shape, sitting on the ground. A moment later, a being one meter tall in a kind of diving suit approached the witness, emitting several times a phrase that sounded like, "Ka-a-lo-o-tri-to-onn." Then the entity returned and entered the apparatus through a kind of porthole. The object then took off rapidly straight up. The database indicates that in Lesparre Médoc on October 16, 1954, at an unknown hour, a professor of history and geography ensured to have seen in the bushes an orange gleam that puzzled him. While approaching he saw a round object, 5 meters in diameter, with nearby a sort of one meter high diver who approached the witness while emitting on several occasions the following sounds: "KA-A-LO-O-TRI-TO-ONN". It then penetrated in the apparatus by a kind of port-hole, then the machine rose quickly vertically. The source is indicated as "Ovni, Premier dossier complet... by Figuet M./ Ruchon J.L., Alain Lefeuvre publisher 1979. The website indicates that on 16 October 1954 at night in Lesparre-Medoc, France, "History Teacher incident." "Orange round object behind bushes along road, 5m diameter. Being 1m tall in diver suit emitted a phrase "Ka--a-lo-o-tri-to-onn" Then returned to craft through porthole. Took off straight up." And: "An object was observed. It departed by rapidly flying straight up until lost to sight. One orange round object, about 20 feet across, was observed by one experienced male witness in a field. One dwarf, wearing a diver's suit, was seen." And: "A history and geography teacher, driving along the road at night, saw in the bushes along his route an orange light. He stopped the vehicle and approached on foot, discovering an object, about 5 meters in diameter and round in shape, sitting on the ground. A moment later, a being one meter tall in a kind of diving suit approached the witness, emitting several times a phrase that sounded like, "Ka-a-lo-o-tri-to-onn." Then the entity returned and entered the apparatus through a kind of porthole. The object then took off rapidly straight up." The sources are indicated as Webb, David, HUMCAT: Catalogue of Humanoid Reports; Delaire, J. Bernard, UFO Register Volume 7 (1976), Data Research, Oxford, 1976; Rosales, Albert, Humanoid Sighting Reports Database. A history and geography teacher, driving along the road at night, saw in the bushes along his route an orange light. He stopped the vehicle and approached on foot, discovering an object, about 5 meters in diameter and round in shape, sitting on the ground. A moment later, a being one meter tall in a kind of diving suit approached the witness, emitting several times a phrase that sounded like, “Ka-a-lo-o-tri-to-onn.” Then the entity returned and entered the apparatus through a kind of porthole. The object then took off rapidly straight up. A professor of history and geography was driving slowly towards Lesparre when he saw an orange light in the bushes. He got out to investigate and encountered a circular machine, 5m in diameter. From it emerged a small figure in a diver's suit, which came up to him and said "KA-A-BO-O-TRI-TO-OUN", several times. It then re-entered the craft through a porthole and the machine rose up at speed. Gross URECAT citing an anonymous letter in Sud Ouest 20 October 1954. Evaluation - Probably a satire on the stories of the time. Note: The source reference "Gross URECAT" is my file as it appears in my CE3 catalogue URECAT; the file content is the same as this page of my France 1954 catalogue. Rogerson did not provide any link and did not reflect my file's content. Although Figuet and Ruchon indicate that the source of this case is the Garreau and Lavier book "Face aux Extra-Terrestres" on page 47, the case does not appear there, in any of the two editions, nor on other pages, it seems. How would anyone be able to remember a "word" such as "ka-a-lo-o-tri-to-onn"? The case, a simple anonymous letter to a newspaper, obviously has no credibility. [---] Article in the regional newspaper Sud-Ouest, Bordeaux, France, October 20, 1954. [ou1] "Catalogue général des observations de la Gironde - Résumé des Archives et dossiers de la section de Bordeaux du C.F.R.U. ", catalogue in the ufology magazine Ouranos, France, Nouvelle Série #9, page 22, 4th quarter 1973. [---] Joel Mesnard and Jean Marie Bigorne, ufologists, France. [---] "UFO Register", compiled by J. Bernard Delaire, Data Research, U-K., 1976. [---] "HUMCAT: Catalogue of Humanoid Reports", compiled by David Webb and Ted Bloecher, Center for UFO sTudies, USA, circa 1978. [bb1] "La Grande Peur Martienne", book by Gerard Barthel and Jacques Brucker, Les Nouvelles Editions Rationalistes publisher, France, page 203, 1979. [mf1] "Catalogue Francat des rencontres rapprochées en France (Listing 800 1982) (2 - Suite)", list compiled by Michel Figuet, in the ufology magazine Lumières Dans La Nuit (LDLN), France, #257-258, page 19, November / December 1985. [js1] "Le Dossier 1954 et l'Imposture Rationaliste", book by Jean Sider, Ramuel publisher, France, page 19, pp 29-30, 1997. 0.1 Patrick Gross December 21, 2007 First published. 1.0 Patrick Gross December 28, 2009 Conversion from HTML to XHTML Strict. First formal version. Addition [ud1]. 1.1 Patrick Gross October 9, 2014 Addition [ta1]. 1.2 Patrick Gross February 2, 2017 Addition [ub1]. 1.3 Patrick Gross December 24, 2018 Additions [ou1], [mf2], [lh1], [pr2]. This page was last updated on December 24, 2018.